“All the News That’s Fit to Print” reads the front page of the New York Times. The same goes with the letters, I suppose. I’m sorry that so much bad news has to be shoehorned into a single page. Ellen/Reid: Last week was just one hell of a bad week. When it rained, it poured – by the bucketful. Reminded me of 2010 all over again, a year I didn’t ever want to repeat. Overwhelming feelings of loss, first for aunt Mary, then your uncle’s law partner. As soon as cousin Tom called with the news, I booked a flight to Portland. It really was important that your uncle and I be there to represent us. Mary was the last tie to an older generation of Andersens and Bradleys, and now there’s just the children left. Then I came down with this damned cold which floored me from Wednesday onward, and I’m still feeling lousy this morning. My intent was to make the go/no go decision about 3:30 Saturday morning, but as soon as I got out of bed, I knew instantly that there was just going to be no way. The cost of the ticket was really of no consequence. Tim took my call about me backing out of the trip, and I knew he was disappointed but I just felt so lousy. I liked Mary so much and it was so disheartening to miss the chance to tell your cousins the same thing in person. I hope we get to see them again under different circumstances vs. the somber events that have brought us together the last few times. Then came the news about the killing of your uncle’s law partner, Todd Elsbernd. He was such a good guy and had been with Ralph for about 20 years. I don’t know all the details but it appears it was a targeted slaying. Todd had stepped out of his office for the day when some guy shot him in the back from a nearby parking lot. It turned out to be some disgruntled former client still upset about a divorce case from several years ago. The shooter also apparently murdered his ex-wife that same day. Ralph’s taking it quite hard. I’ve only talked with him briefly but you can tell from his voice that the shooting has had a significant impact on him. It’s hard to even imagine something so horrific happening to anyone at any of the place’s where we work, let alone in Grand Island, Nebraska. I don’t know. It just seems that are so many crazy people out there with guns. That could be because there are just too many guns out there, period. One of the first things that came to mind right after the killing was “Is Ralph being targeted, too?” I tried to call him several times but he was already working with authorities to piece together what happened and why. He said it was the first time in his years of legal work that he feared for his safety. In a way, all of this will put Thanksgiving into that much more perspective. 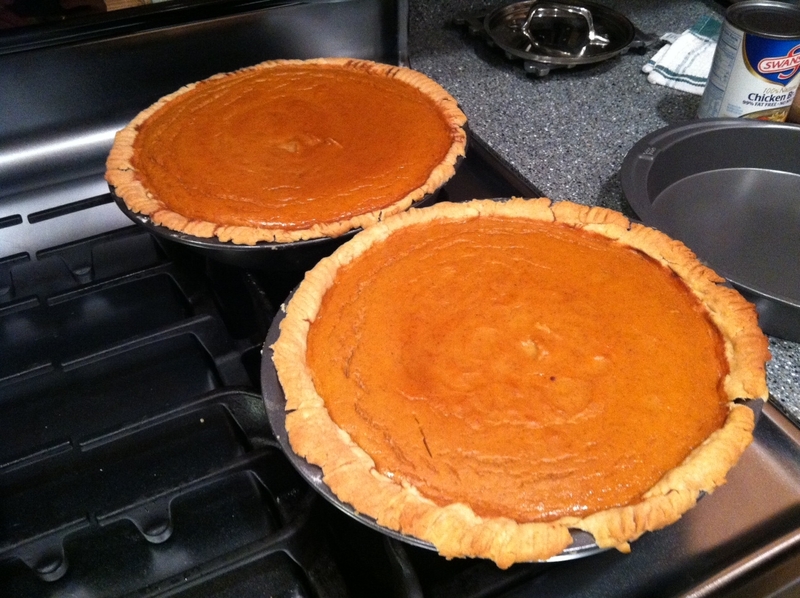 Even the pumpkin pies for Thanksgiving came out bad. I’ll be back in the kitchen later today to try, try again. Usually I eat my mistakes but I don’t know about this brace of so-so results. There’s not enough whipped cream to turn these two into something edible. We will have much to be thankful for. The new jobs for you both plus Tim’s new situation at 3M. And little miss Emma, to be sure. Alley and Joe and Andy and Steph are both set to be parents again. So there is plenty of good news for us to celebrate. My final blog class is this week. There’s a sense of relief about it. I’m just not sure I’m a good blog person. So much of it is sizzle and technology, both of which have sort of passed me by. The content creation is one thing, it’s the other stuff that could be buffed up a fair amount. I’ll have to cross that bridge on it soon enough but it’s probably best for me, and the students, if I stick a little closer to wordsmithing and writing. Reid, you know all of this like the back of your hand. The city is abuzz about the big game tonight between the previously hapless Panthers vs. the tough Patriots. I’d like to watch the entire game from the comfort of my couch but they don’t kick off until after 8:30 p.m. which means no matter how bad I want to see the ending I’ll be out like a lamp long before the end of the game comes around. I’ll just have to check my ESPN app as soon as I wake up. I’m okay with that. With this cold, I’d rather get my sleep.